Last Friday the Fast Forward 2017: Breaking the Glass Ceiling conference (hosted by Bristol Plays Music) was a landmark moment and a potential game-changer for music and disability. In this article we share news from a day that was packed full of important messages and notable progress. “Since the National Plan for Music Education was written, new technologies and innovative practice have contributed to a significant improvement in opportunities for young musicians with special educational needs and/or disabilities (SEN/D) to take part in meaningful music making. 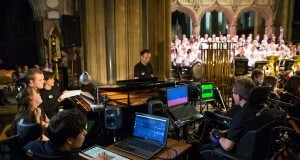 Where previously the focus was on participation, now young people with profound and multiple disabilities are able to perform music alongside their peers in professional venues and on national television and radio. Despite this positivity, there is no shying away from shocking statistics that demonstrate there is a long way to go. Bristol Play Music’s Siggy Patchitt stated that at the last count 19% of the working age population was disabled but within Arts Council England’s National Portfolio Organisations only 4% of the workforce identified as disabled. Suzanne Bull, CEO of Attitude is Everything, went on to make clear that whilst there has been improvement in access for audiences (that said 2 out of 3 disabled audience members still can’t find the access information they need online), there has been little development in artist accessibility and artists are frustrated with playing ghettoised ‘disabled gigs’. Musicians Lloyd Coleman, James Rose Charlotte White and Kris Halpin shared their journeys into the music profession. It was striking to note that without sheer determination and perseverance against some challenging barriers, and without dedicated individuals supporting their journey, they may not have made it into the career they are in – this can’t be the case if accessibility is to become the norm. The big star of the day though was the launch of the National Open Youth Orchestra (NOYO), which builds upon the success of the South West Open Youth Orchestra and will be the country’s first disabled-led youth ensemble. Over the past year we have created the NOYO Feasibility Study having been commissioned to do so by OpenUp Music, and there’s no doubt in our mind that NOYO will be a powerful catalyst for change in music education and industry. Watch this space for the publication of the Feasibility Study and its recommendations later this term.